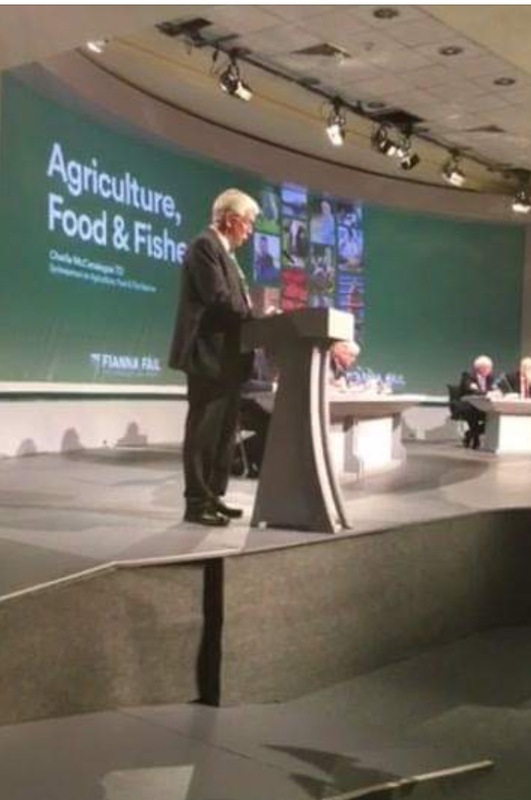 Carrigallen based county councillor, Paddy O'Rourke addressed the Fianna Fáil Ard Fheis over the weekend. He expressed his "concerns for the future of our suckler herd" noting "without urgent meaningful support" this "will disappear from our agri landscape, particularly on the more marginal land, clearing the way for the acceleration of blanket forestry." Cllr Paddy O'Rourke is pictured addressing the Ard Dheis. Cllr O'Rourke pointed out that dairy farming is not an option for every landowner particularly those on marginal land or fragmented holdings. He warned that "the skill set of our farmers who have proved themselves in bringing the finest potential beef cattle to the market is in grave danger of being lost". "It is clear that the current support through the genomic scheme and the more recently announced BEEP scheme (to which only half the expected number of cows have been registered) is grossly inappropriate to help maintain the herd. I find it insulting to hear some suggest that a coupled payment will result in indiscriminate breeding and a glut of inferior stock. Our farmers know what the market requires and have proven their ability to produce it. The coupled payment of €200 a head currently paid to French farmers proves that it can work and we need a similar scheme alongside the existing supports," he said. "As a local Councillor, I have been consistent in calling for such a scheme for several years now since the decline of the herd became evident. The social cost of the demise of our suckler herd is incalculable and must be addressed. We are having this discussion on the backdrop of having been told that an application from a Libyan businessman who wanted to purchase 4000 bulls has sat on Minister for Justice, Charlie Flanagan and Minister for Agriculture, Michael Creed's desk since last November leaving the businessman no option only to source those cattle elsewhere at a time when our cattle prices are on the floor. What does this tell us about this governments commitment to our suckler farmers or indeed to rural Ireland?"